Elemental ~ Jewelry With Substance: Here's The Secret...These Blossoms Are Bewitched! Just call me Samantha 'cause I'm feeling bewitched! LOL. Look at this gorgeous new dress from PurpleMoon. I love it! It's part of a new retro line, and you really must go have a look. I had a difficult time making up my mind which color to buy, and I may yet go back for more. Plus, I really needed something beautifully golden to wear with my new Bewitched Blossoms jewelry. The set I'm wearing is yellow coreopsis--one of the newest releases at ELEMENTAL JEWELRY. A couple of years ago (can't believe it's been that long!) I was taking some photos in my garden, and it struck me that the colors would be fabulous for jewelry. 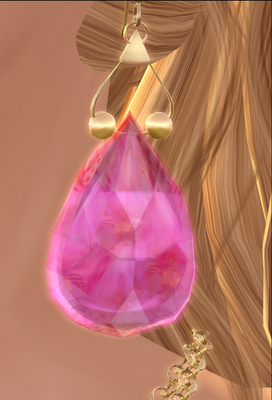 So I played with it and came up with the Bewitched Blossoms jewelry concept--flowers encased in faceted, glowy gems. At a distance, they look like beautifully colored, sparkly gems. But if you zoom in, you see the stunning secret! I love them all, but the pink orchid version below is my absolute favorite. The original Bewitched Blossoms jewelry is being phased out, but it's all being replaced by updated items. 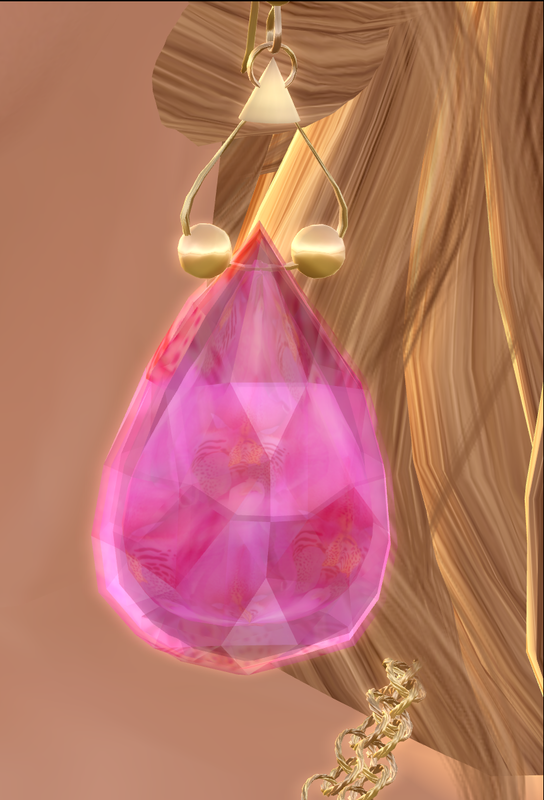 The textures have been improved, the design has been updated for better resizing, and the necklace is now layered with a semi-precious gemstone pendant. You'll find lapis lazuli with the blue hydrangea necklace, yellow sapphire with the yellow coreopsis, and pink rhodochrosite with the pink orchid. These three sets were in the 60L Weekend Sale for April 28, but since I'm late on my blogging I will leave the sale for a couple of extra days. (I was late because I just opened a new shop--more later.) Hop on over to ELEMENTAL JEWELRY and get a set before the sale ends! Jewelry: Bewitched Blossoms 2 Necklace & Earrings from ELEMENTAL JEWELRY in SL. Available in yellow coreopsis, blue hydrangea, or pink orchid. Hair: Truth Hair--Isabel, dark blondes. Purchased full price. Skin: Curio--Jewel Gold Tones--Light Shell Sapphire. Purchased full price. Dress: PurpleMoon--Cha Cha dress in black/yellow. Purchased full price. Shoes: Honey Bear pump in black. I purchased these ages ago, and I don't know whether they are still available. However, they are the perfect, classic pumps, and I have them in many colors. Location: I'm at my SL home.